EDITOR’S NOTE: Spacing illustrator and contributor Mathew Borrett has joined our blog team and will post occasionally about interesting finds in the City of Toronto Archives and the stories behind the images. Like most cities, Toronto is a lot flatter than it used to be. The shapes of many early neighbourhoods were defined by ravines and meandering creek beds. Seen as obstacles to development, they were aggressively filled in and their waters relegated to dark pipes underground. The buried Garrison Creek is a prominent Toronto example. A few sections remain only partly filled — Bickford Park, the bowl in Trinity Bellwoods, the dip on Ossington between College and Harbord. By the time of the Garrison’s internment, it had become little more than an open sewer and convenient dumping site for the population exploding around it. Taddle Creek, Walmsey Brook, and many others suffered similar fates. Now these waterways are storm drains and sewers, absorbed into the city’s infrastructure. A section of Garrison Creek used to wind northeast across College at Shaw street. In the late 1800s a modest collection of houses sprouted here on Sully Crescent. A long wooden stair connected the end of the crescent with Shaw Street above. The present-day Dominion grocery store (now Metro) on College and Fred Hamilton Park now occupy the filled land. How many shoppers, as they cross the parking lot to pick up a few groceries, realize that a neighbourhood once stirred far below their feet? 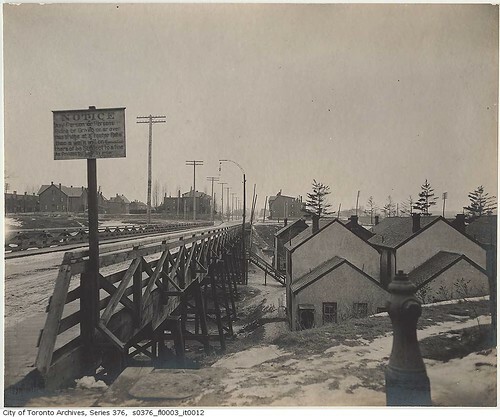 Shaw Street bridge passes above Sully Crescent, looking north to College, 1901. Note the complete lack of development on College, and the empty space on the right, still an open field right up to Bloor St.
Sully Crescent 1921, looking NW. The bridge (left) has been buried. On the right is the rear of a baptist church now known as the Revival Bar. 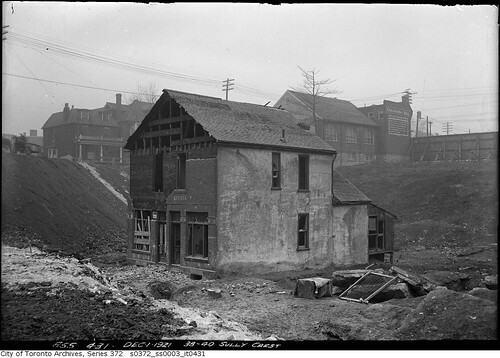 All photos are from the City of Toronto Archives. So wait, Mathew Borrett = Mustapha on Urban Toronto? This is interesting stuff. I love how the 4 ‘sentinel’ houses are still standing today. Is that Garrison Creeks’ “interment” or “internment”?? I suppose its interment could be considered internment. Nope, I am not he. Those 4 ‘sentinels’ are great houses. Basically the same, but each has slightly different details on the facades. I love these stories of the Toronto That Once Was. Always make me look around with new appreciation and as an added bonus, gives me plenty of new stories to share with friends and family. David, this is indeed a curious co-incidence. I googled Sully Cres a few weeks ago – must have been a matter of days before mustapha’s fine UT post. Perhaps the ghost of Sully Crescent is stirring and we both got the psychic memo. Indeed, the archives are vast. Hopefully I can dig up some fresh or rare gems. There’s bound to be the occasional familiar faves (at least to those familiar with the archives). I have in mind a wide variety of themes – some posts about people and events in addition to archi/infrastructural or location specific. Neat photos. Any chance of either hotlinking them from the archives site, or posting the URLs? It would be nice to be able to zoom in on some of those a little better. Good idea Brent. Links have been added. I am particularly interested in that second shot looking down the bridge. It is still a little unclear but it looks like we have a light standard halfway down the bridge at the stairway. 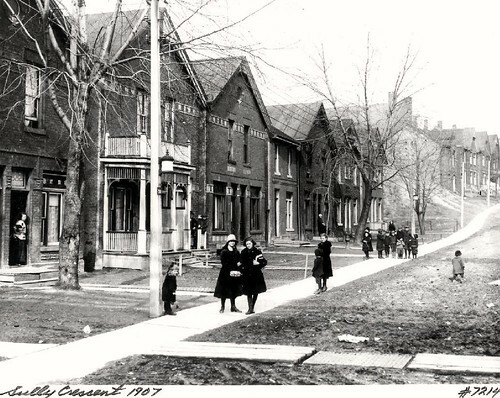 The last photo shows the typical Toronto light standard at the time (there are still some examples on either Ward’s Island or Algonquin Island). On the bridge there is a pole by the stairs that has a cantilevered arm, from which something is hanging that appears to be a lantern of some sort. There is also some sort of wire at a diagonal (for lowering the lantern so it can be lit?). Maybe bridges weren’t typically illuminated, but there was a special case here so that the stairway could be illuminated? Excellent sleuthing job, Matthew. 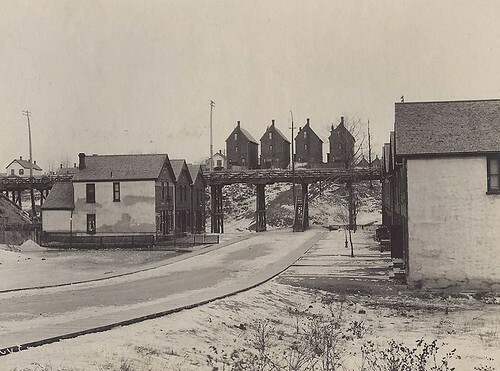 Note that the third house from the left in the 1907 picture is the sole house remaining and undergoing demolition in the 1921 picture, just 14 years later. I think we can assume that the Sully Crescent ravine was filled in soon thereafter. What heartbreak some of the Sully Crescent residents must have endured upon losing their homes and neighbourhood we can only guess, but we can also guess that there foundations and basements, if any, were probably frequently wet as well. Comments welcome.